Janet Yellen, technically “Chair of the Board of Governors of the Federal Reserve,” but more colorfully known as the “Fed Head,” has been preparing the market for an interest rate increase most of the year. She now seems likely to push for a quarter-point rise at a meeting on December 16th. A prediction tool called CME FedWatch shows the probability of a rate increase to be 79%. 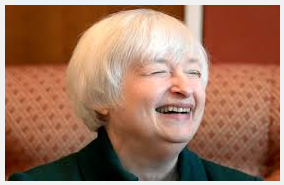 The talking heads in the financial news say that after this long wind-up, it’s time for the Fed to act. To do nothing would risk the Fed’s “credibility.” People may come to doubt that the Fed will do what they say they will do. This could make investors more uncertain and hurt economic growth. A better question about “credibility” may be whether anyone should believe that the Fed can achieve their goals of 2% inflation and full employment simply by manipulating interest rates. Fed officials certainly try to look the part of experts. They are well-credentialed, have gray hair, speak confidently and have a staff of hundreds who produce long reports that are too boring to read. But is there any reason to think that in such a complex system as the global economy they can know how to set the stage for prosperity? Leonard Read wrote a famous essay, “I, Pencil,” which showed that no one understands the steps involved in producing even a simple product in a complex market. Are we really to believe that a group of economists can accomplish the vastly larger task they’ve set for themselves? Markets work better without price controls. The Fed should work toward reducing its influence over the economy, even to the point of eventually putting itself out of business.